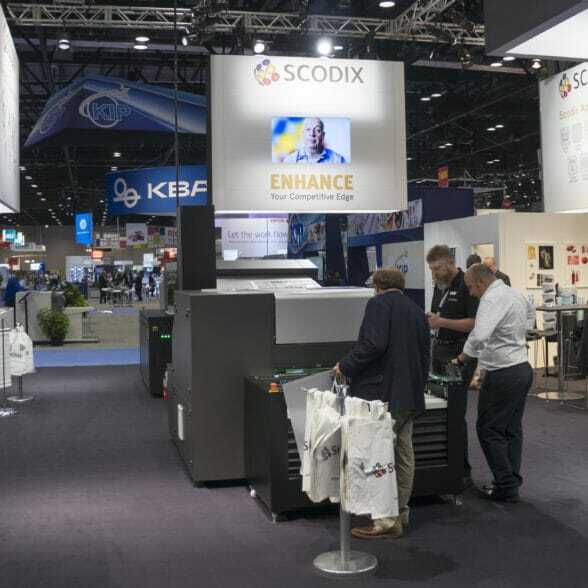 Scodix Ltd is the leading provider of digital print enhancement presses for the Graphic Arts industry, offering print service providers and converters the ability to add value to the products they provide to their customers. 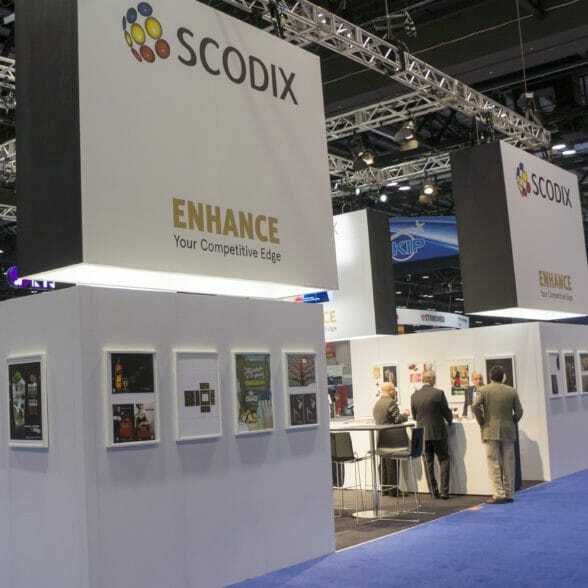 Prior to Drupa 2016 Plant the Brand has been chosen by Scodix to develop a brand experience concept. The customer briefing appeared to be very focused on displaying products and functional layout details which offered us a very large degree of freedom to complete the image of the company through appealing design and creative directions. During the development process regarding the Scodix brand experience concept we decided to focus on the added value the company is delivering to the Graphic Arts industry. 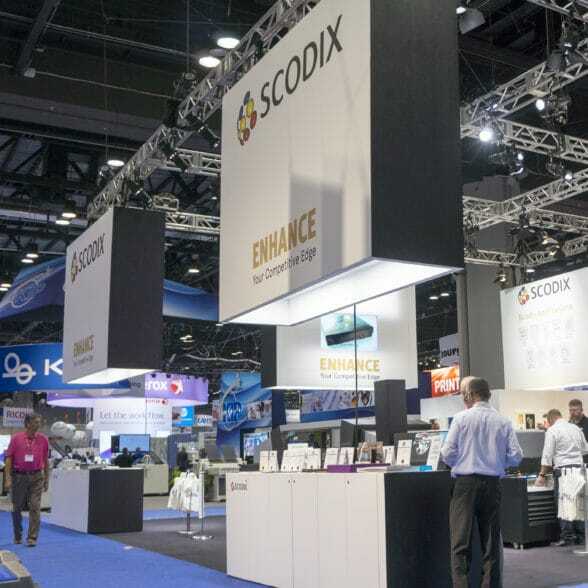 In accordance with information derived from a market survey decision was made to position Scodix as premium brand within its industry. The presence of the color black, which had a minor role in the corporate identity of Scodix, was optimally utilized in line with the appearance of a premium brand. The Scodix Brand Experience design is characterized by its openness and accessibility from all angles. In heigth the Scodix brand was communicated to the public on large dominating light units. On the inside of these blocks four video walls have been integrated continuously presenting the live demo of the printing process within one of the exhibited three presses alternated by corporate movies. The three enhancement presses were positioned on the main aisles each supported by large display tables on which “the proove of the pudding” was presented in detail. On the black surface of these display tables a tactile print was situated emphasizing the added value of all Scodix solutions by experience. One of the solutions is for example “Braille printing”. The hart of the brand experience contains the hospitality area as well as two meeting rooms covered by a huge banner filled with lighting dots. The surrounding wall elements served as a gallery for the presentation of print enhancement samples. 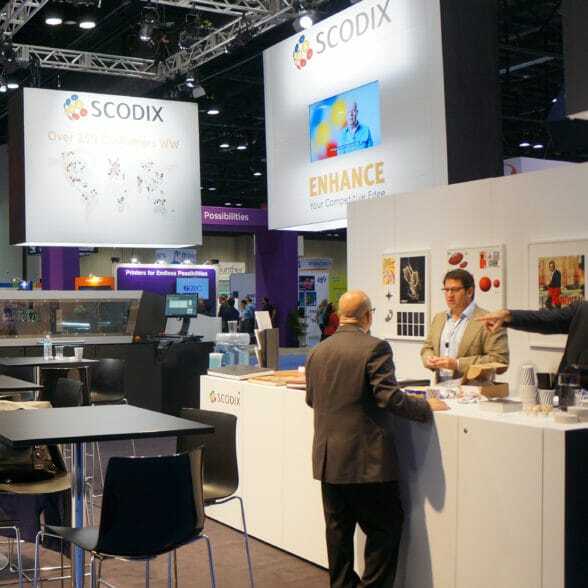 The Scodix brand experience became one of the most successful effective concepts at the Drupa 2016; Scodix sold more than 4 times the predicted forecast.